Latest Research: Online eCommerce Market worth &pound;28Bn by 2020. Research entitled ‘Britains Retail E-mpire study’ by OC&C Strategy Consultants (in collaboration with Google) stated that online sales generated by UK retailers from overseas markets are due to increase sevenfold to £28bn by the year 2020. Online sales from outside of the UK rose to 4bn in 2012, contributing to 14% of total sales online. This number is set to grow dramatically to 2012, outpacing domestic activity to reach 40% of total online sales. Google has called on businesses to take advantage of new international opportunities online as communications and transactions between online companies become more seamless over time. The biggest growth is set to be realised in Europe and Asia. Sales revenue from Western Euopean countries are to soar to £9.8bn in 2020 (£1.5bn in 2012). This rise is a result of ‘favourable trading conditions’ due to low barriers to entry through the EU as well as the increased ease of delivery across Europe. The report also gives indication as to how internet users in surrounding countries are more frequently searching for products in the UK. The number of consumers searching for British brands such as Asos, Burberry, Jimmy Choo, Net-A-Porter and Topshop has grown by 46% since 2010, showing that consumers are becoming more attuned to the idea of purchasing internationally. Anita Balchandani, partner at OC&C, commented: "eCommerce has transformed what was once a game anchored in local markets – with retailers choosing to expand internationally when they reached saturation nationally – into one where they can pursue internationalisation at the same time as domestic expansion. 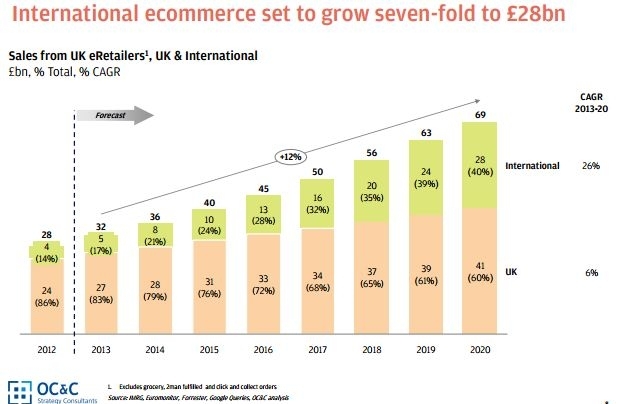 What does this mean for eCommerce businesses in the UK? This recent news should prompt thoughts in the marketing manager’s mind. Local SEO strategies will have to be reviewed to accommodate a wide reach. Delivery limitations should seldom be an issue in 2013 and online shops need to provide international shipping options in order to tap into overseas markets. Adapt your SEO strategy to make sure your business is visible in other countries as well as the UK. eCommerce website providers such as ExtraDigital not only offer effect online shop solutions, but multilingual SEO services to make sure you will be able to capitalise on this growth in the coming years.